Can Indian goods compete against foreign stuff even in the Indian markets, given the high taxes? An archetypal Indian, let us call him Ram Lal, pays water tax, municipal tax, road tax, house tax, sales tax, central sales tax, professional tax, value added tax, octroi, service tax, excise duty, customs duty and myriad other taxes. Then, on whatever money is left with him, Ram Lal has to pay income tax. Ram Lal has also to pay a number of cesses and duties – education cess, krishi kalyan cess and Swachh Bharat cess to name a few. 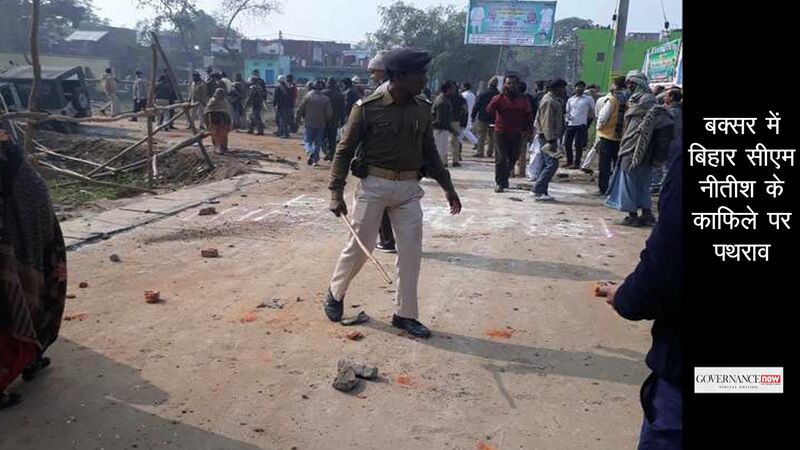 No wonder Ram Lal feels short-changed when he sees Bharat getting dirtier, roads developing newer potholes, farmers committing suicide and the number of illiterates rising. To collect all these taxes, the centre, states and municipal corporations have full-fledged tax departments which have full authority in law to enforce their just and unjust demands. Incidentally, this elaborate tax collection machinery is also financed by the taxes paid by Ram Lal. Everyone talks about the ills of black money and tax evasion but, seen from Ram Lal’s perspective, it is indeed surprising that we do not have more tax evaders. 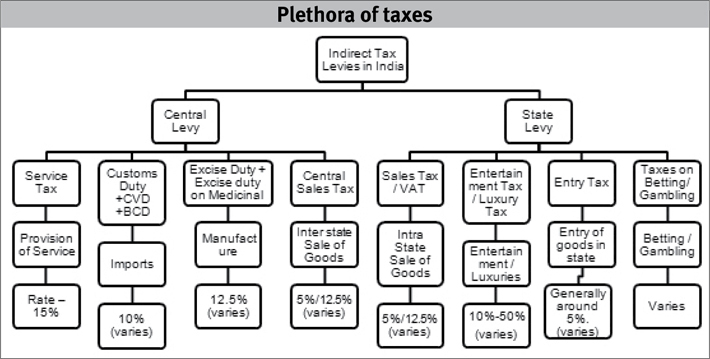 The accompanying diagram gives an idea of the indirect taxes levied by the centre and states on various goods and services. The problem of multiplicity of taxes is compounded by the high and cascading rates of taxes. The proposed goods and services tax (GST) is touted as a solution to these problems and in the concluding part of this article I will try to examine whether GST would be the panacea it is claimed to be. But first a word about the existing structure. The high rate of indirect taxes works to the detriment of the economy in various ways. Firstly, it fuels inflation. On every call you make, service tax is levied at 15% of the call charges, which makes telephone calls that much costlier. Petrol and diesel which have a landed cost of around Rs 28 per litre are sold at nearly Rs 80 and Rs 65 per litre respectively courtesy central and state levies. These taxes have increased over the years. Consider service tax. When introduced in 2003, its general rate was only 5% and only some specified services attracted service tax. Now in 2017, service tax is levied at 15% on all services except some (exempted services). Though crude prices are now around $50 per barrel, petrol and diesel prices are the same as they were in 2012-13, when the price of crude oil was at an all time high of $110-$120 per barrel. Such increase in the rate of indirect taxes increases prices across the board leading to unbridled inflation. Governments are disingenuous when they blame extraneous factors for inflation, conveniently ignoring the role of rising indirect taxes. 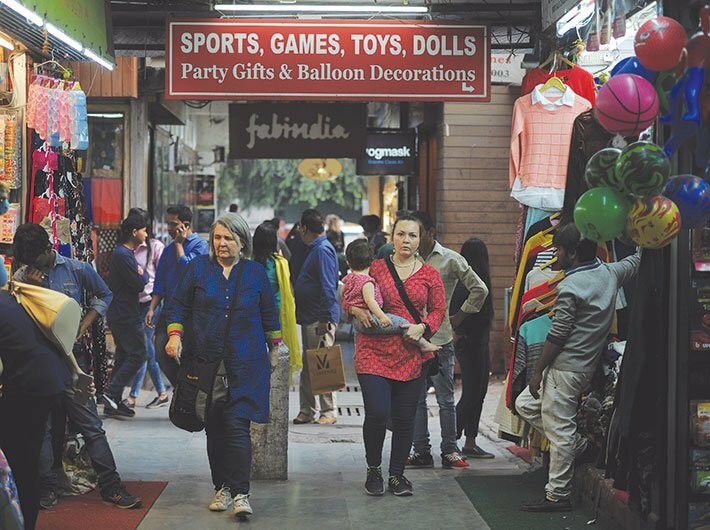 In our own country, to finance its rising expenditure, the government has imposed an unconscionably high levy on items of common use which has fuelled inflation and made our economy a high-cost, regressive economy. The poor are the worst hit by inflation because they also have to pay the same increased prices as the rich but do not have the resources to do so. According to economists, indirect taxes are regressive, that is, the poorer you are the more indirect taxes (in percentage terms) you have to pay. Increasing the level of indirect taxes is counterproductive because it negates the food and other subsidies doled out to the poor. It may be a truism that man does not live by food alone but it is a topic of serious introspection whether the aim of the Indian state is to provide only cheap food to the poor so that they can keep their body and soul together to supply votes and cheap labour as and when required. A poor man falls ill more frequently than his rich neighbour. A poor man also needs a house, his children also need education. Today, except the food part the poor man has to fend for himself. Government schools meant for him are hardly up to the mark. The less said about government hospitals the better. It is obvious that the succeeding generations of the persons surviving at subsistence levels would be doomed to the same fate. The villain of the piece is the ever-rising level of indirect taxes which lead to inflation which in turn leads to an increase in taxes because the government needs to levy more taxes to finance its myriad activities. Thus an unending vicious cycle is set up. It is for the government to tighten its belt and break this vicious cycle of rising taxes and rising inflation. Another consequence of runaway taxation is that the prices of Indian goods are now too high to compete with Chinese goods in the international market. Chinese goods are cheaper than Indian goods even in the local market. This is because the input materials of all goods, like electricity and diesel, are extortionately taxed here. We have to rationalise our tax structure so that our goods are priced competitively; otherwise our manufacturing sector, which is already withering, would be priced out of the market – Make in India or no Make in India. The unnatural structure of Indian taxation becomes apparent if we look at the comparative statistics of collection of direct taxes, that is, income-tax collection, vis-a-vis collection of indirect taxes in the current financial year (up to February 28). The indirect taxes collection in this period was Rs 7.72 lakh crore showing an increase of 22.2% while collection of direct taxes was Rs 6.17 lakh crore, an increase of 10.7%. Thus, for the first time since financial year 2006-07, indirect tax collection is slated to exceed direct tax collection. Regrettably, the abnormal increase in indirect taxes is a continuation of the trend set in motion by the Budget 2015, which increased the rates of indirect taxes so that collection of indirect taxes increased by 31.1% in 2015-16, while direct taxes grew by a modest 7.61% in the same period. In an economy like ours, where the share of manufacturing is hardly 15%, if indirect tax collections exceed direct tax collections then one can safely surmise that indirect tax rates are too high. Contrast these statistics with that of advanced economies which uniformly have a high direct-tax-to-GDP ratio and a high direct-tax-to-indirect-tax ratio. Our country was on the same trajectory and in 2014-15 direct tax to indirect tax ratio was 56:44 and direct taxes accounted for 5.55% of GDP. In financial year 2015-16, this ratio came down to 51:49 and direct tax contribution to GDP came down to 5.47%. The phenomenon of indirect tax collections surpassing direct tax collections, which are also losing momentum, means that incomes are not rising and increased tax is being collected on manufacturing. It is also not difficult to conclude that the trend of abnormal increase in indirect taxes, despite a fall in production (as evidenced by falling or stagnant PMI), shows that unconscionably high taxes are levied on production; which are collected from the rich and the poor alike. In the short run this would lead to increased poverty and further marginalisation of the poor. If the current trend continues for some time, the results would be truly disastrous; we would land into stagflation (inflation without growth), a situation in which the economy goes into a tailspin. Coming to what we can expect in the near future, GST will definitely address the question of multiplicity of taxes and would decrease the compliance cost. However, the proposed GST also has two higher slabs of 18% and 28% (plus a cess which can go up to 290%) which would ensure that there is no decrease in the taxes to be paid by you and me. Also, given the current level of its expenditure, the government cannot afford to forego even a part of its revenues. So even after the advent of GST, we would still be left with the problem of rising indirect taxes and stagnant direct taxes. A solution to this problem can only be found when the government realises the folly of its ways and cuts down on its expenditure. The finance ministry has to rein in its urge to pluck low-hanging fruits, which means that it has to curb its propensity to garner revenue easily by increasing excise duties. Rather, the finance minister should address the expenditure side of the budget. A hard look needs to be taken at the galloping government expenditure and burgeoning government yojanas. According to estimates, if welfare spending is totalled up, each of the 125 crore Indians would be a crorepati. Even if go by Rajiv Gandhi’s theory that only 15% of government funds reach their intended beneficiaries, then also all of us should have been in a much better position than what we actually are. 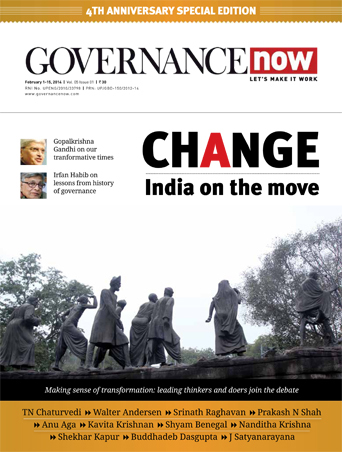 If we look at successive budgets, in the early 1950s government expenditure was of the order of Rs 1,000 crore which went up to Rs 10,000 crore in the early 80s; which now is almost Rs 20 lakh crore. To meet this ever-increasing expenditure, every year the government sets highly ambitious targets for collection of taxes. Faced with unachievable targets, tax officials resort to strong-arm methods, which are decried as tax terrorism. Sometimes unrealistic tax assessments are made to boost collections, which lead to litigation and in most cases degenerate into unrealisable arrears. The PAC has noted that tax arrears now exceed the annual collection of income tax. The numbers-based approach of the government is the root cause of this problem. It may be appreciated that in most advanced countries no targets are set for tax collection, the emphasis being on the process of tax collection, which results in fewer grievances and significantly less unrealisable arrears. A way out of the high taxes-high inflation vicious cycle is by making fundamental changes in the way the budget is framed. In the current scenario each ministry gets a fixed amount of money which is supposed to be distributed to its constituents but in actuality the money is handed over at the last moment and bogus bills of utilisation are prepared and outcome is never monitored. Most of the time, taxes are collected even without any plan of utilisation. The reason for this sad state of affairs is that maximisation of tax revenue appears to be the only goal before the government. Perhaps it has forgotten that taxation should be at levels which would encourage growth rather than stymie it. The current financial statement of the municipal corporation of Greater Mumbai (MCGM) is a typical example of mindless taxation. It appears that MCGM has fixed deposits of more than Rs 60,000 crore but still it provides abysmal civic services. This is true even at the central and state levels where ministries and departments routinely return allocated funds or use them at the last minute. It is not difficult to conclude that there would be substantial savings if the budget is framed in a way that funds are allocated to ministries and departments according to their needs and their capacity to utilise the funds being put at their disposal. The correct approach to frame a budget may be to plan from bottom up rather than top down – as has been the practice so far. In the proposed scenario, the needs and growth opportunities of the people of a village would be identified and a plan would be prepared for each village and thereafter all such village plans would be aggregated to form a district plan which would be aggregated to form a national plan. Needless to say, the outcome in each unit could be closely monitored (given the small size of the unit) which would make planning and budgeting a meaningful exercise. Most importantly, this would also reduce government expenditure significantly and would provide a respite from the vicious cycle of high taxes and inflation, which has caused immeasurable harm to our economy. Village-level planning would also be a vindication of Gandhian economics and would cut down corruption in the system, given the monitoring of expenditure by the beneficiaries. Saxena, an IRS officer of 1979 batch, retired as principal chief commissioner of income-tax, Mumbai in 2016.